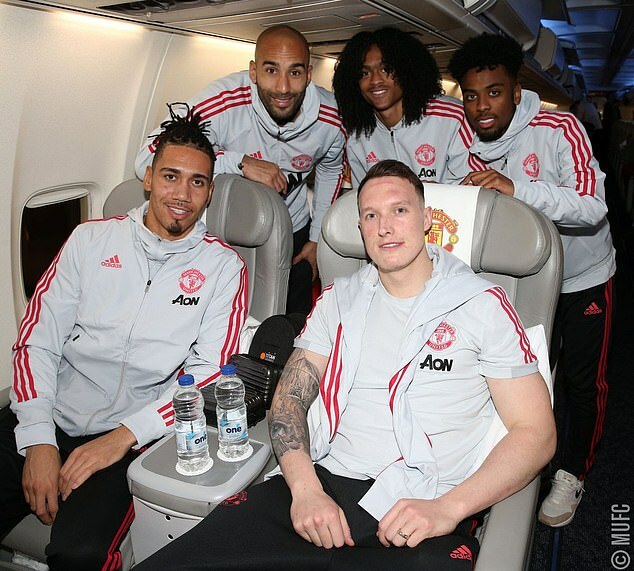 Manchester United have begun their journey to Dubai for their four-day warm weather training camp. The squad were pictured arriving at Manchester Airport just hours after their 2-0 victory over Reading in the FA Cup on Saturday afternoon. The squad looked in good spirits after a penalty from Juan Mata and a strike from Romelu Lukaku sealed a fifth straight victory for caretaker manager Ole Gunnar Solskjaer. The four-day camp in the Gulf is designed on building on fitness and tactical familiarity. The team did the same last year and are looking to gain the edge ahead of Sunday’s huge clash with Tottenham at Wembley. Solskjaer does not want his players to treat their time in Dubai as a mid-season break. ‘I’ve had plenty of time to speak with them but we haven’t had plenty of time to train,’ he said, when explaining the reasoning behind arranging the mid-season training camp. ‘It’ll be a time to get some fitness work and work hard with them, so if any of the players think it’s a holiday they’re wrong.